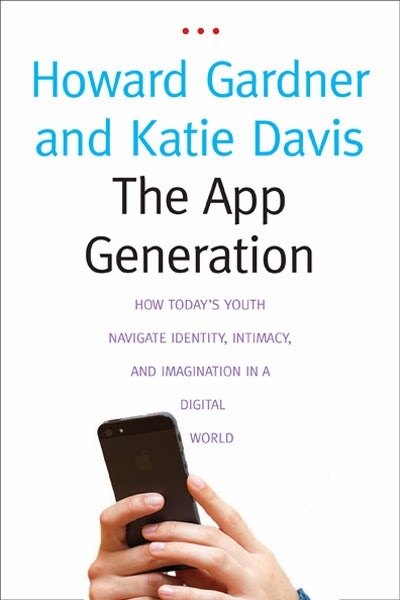 Howard Gardner, father of multiple intelligences, has written a book with Katie Davis: The App Generation: How Today's Youth Navigate Identity, Intimacy, and Imagination in a Digital World. And The New York Times recently published a review of said book. I haven't read the book so I'm not reviewing that, but the review did cause me to think a bit about this digital generation and about the need for digital connectedness. As is the case with so many things, concern about digital distraction is not new. When I was at the movies the other night, I wasn't really surprised by how quickly those little screens started glowing as people raced to see what they had missed, perhaps to tweet some thoughts about the film. It's hard to know. When I travel, I'm annoyed by the people who walk through the airports with their eyes glued to their smartphones. I actually laughed out loud when two business people crashed into each other because they'd been looking down at their devices. First they looked anger, and then they were abashed. After awkward apologies, they went on their ways. Only a few steps later, eyes back down. Lesson clearly not learned. Don't get me wrong. I love technology. New stuff comes out and I start to salivate figuring out if I really need it or just want it. It's usually the latter. Any technology comes with impacts and consequences, many of which we cannot possibly be aware because people are constantly surprising inventors by the way they choose to use a product. I appreciate the student's question: how is school still relevant? What kids need to learn and continue to learn is that it's not just about the information and that knowledge doesn't come from looking something up on the Internet. School can be relevant only if teachers--at all levels and in all content areas--are teaching students how to make use of that information, how to assess the veracity and quality of it, how to choose which information is the best information out of all the possible resources available, and more. That all of that work is when learning, practice, and discovery become knowledge. School can continue to be relevant as students continue to learn what it really means to be a lifelong learner, and that it's more than just having access to information. That knowledge isn't what one looks up, but what one acquires over time as a result of a wide range of experiences, including school. Focus. I can. . . squirrel!